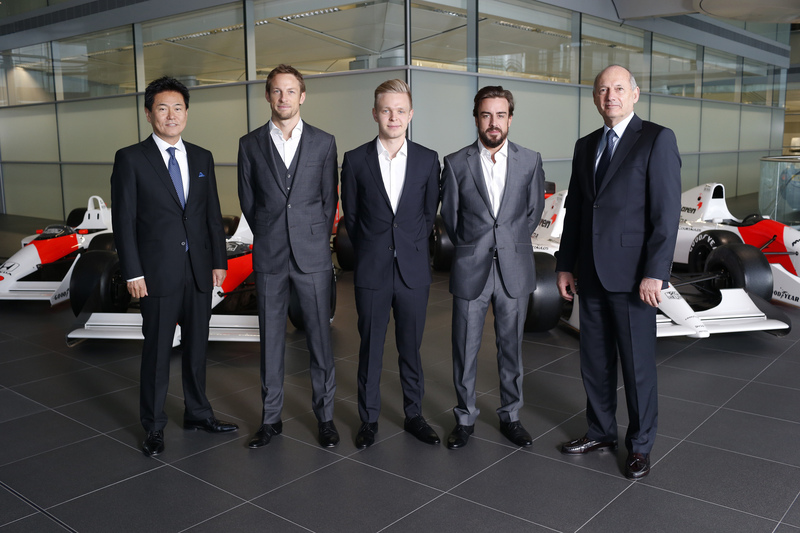 It’s not the Four Horsemen and J.J. Dillon, it’s McLaren Honda! At first, I didn’t like the idea of McLaren demoting, or even worse, cutting ties with Kevin Magnussen just to squeeze one more year out of Jenson Button’s Formula 1 career. I didn’t like it a bit. Not even twelve months had passed before McLaren signed Sergio Perez, who by the summer break of 2012 was absolutely red-hot with three podium finishes, two genuine brushes with victory at Malaysia and Italy – hell, he was strongly being considered as a mid-season replacement for the struggling Felipe Massa at Ferrari – before they let him go because he was underperforming compared to Button in a mediocre car. They had promoted Magnussen in Perez’s place, with all the promise that the former Formula Renault 3.5 Series champion, just the second former champion to earn a promotion to Formula 1 the very next year after Robert Kubica, would be a star of the future. That promise seemed to be fulfilled when he scored a podium finish upon his F1 debut at the Australian Grand Prix, the first driver to put it on the podium in his F1 debut since another McLaren young driver of note named…Hamilton, was it? But after his form seemed to tail off afterwards (so did McLaren as a whole after Melbourne), and Jenson Button drove toward the end of the season like, well, like his career was on the line, McLaren were seemingly ready to burn through two different drivers, both under the age of 25, in a span of twelve months just so they could keep Button and bring in Fernando Alonso, who would absolutely never, EVER come back to McLaren the way their partnership ended so acrimoniously in 2007. You know, just like how Kimi Raikkonen would never come back to Ferrari after being bought out of the largest Formula One contract to date to make room for Alonso in 2010, and like how Nigel Mansell would never come back to Williams after announcing that he was leaving for 1993 – during the middle of his championship season in ’92 – to go to IndyCar, and like how Paul Tracy said he would never “race for hot dogs and hamburgers” in the newly-unified IndyCar Series early in 2008, only to then make a one-off months later that year – and for the Vision Racing team run by Indy Racing League founder Tony George no less, the most hated man among the very same Champ Car supporters who had for years rallied around Tracy as a hero to them beginning shortly after the 2002 Indianapolis 500. As of today I will be contributing to RaceDepartment.com as a motorsports writer. My first assignment was the signing of Esteban Gutierrez by Scuderia Ferrari. I still intend to write for A Motorsports Blog, but as my work hours have become plentiful and new commitments are added, it has taken up a lot of time. Thank you and I hope to hear your feedback.